Many test batches yielded this homemade deodorant stick that stores well, smells great, and keeps odor away! Plus it is EXTREMELY economical to make. This year has been my year of experimenting with deodorants. From oils and butters to waxes and powders, I have tried so many different DIY deodorants. While I still love my nourishing homemade deodorant for sensitive skin, it has a short shelf life. I prefer to make big batches of my favorite DIY beauty products. That way I have enough to last several months. Because of this, I needed a deodorant that could sit on the shelf for several months. A homemade deodorant stick was my only option. I started researching natural ingredients for my homemade deodorant stick by checking out what is in commercially sold natural deodorants. Comparing ingredients in natural, commercially made products is a great way to start any DIY. Especially because natural products are often made with simple ingredients. This is especially true of solid deodorants. Some common ingredients I found in natural deodorants are shea butter, sunflower seed oil, jojoba, arrowroot powder, baking soda, candelilla wax, and Vitamin E.
I keep all of these things at my house for DIY projects, so it just made sense to give it a go! The first homemade deodorant I made was a little too sticky feeling and quite soft, so I played with the formula until I got a nice consistency, scent, and firmness. The result was a solid deodorant that is easily stored, smells great, and keeps me smelling great too! Plus it is EXTREMELY economical to make. My recipe makes almost four full deodorant containers! 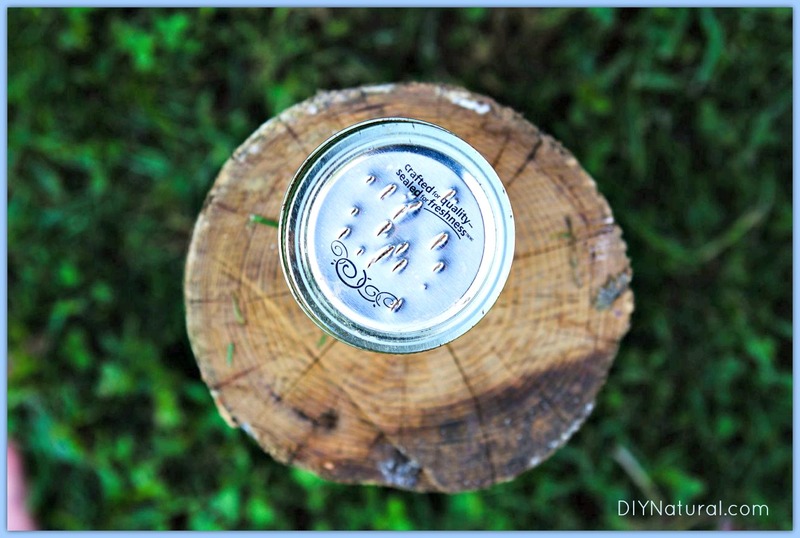 I recycled empty store-bought deodorant containers for this DIY which made it, even more, cost-effective. This homemade deodorant contains jojoba oil, which is actually a wax. Jojoba feels less oily and gives this deodorant a more smooth and less sticky feel. Shea butter gives this homemade deodorant stick a nice spreadable consistency. It is also a lovely skin moisturizer and protector. I was very hesitant to use baking soda because it can be irritating to skin in large amounts. I decided to use a higher percentage of arrowroot powder in my homemade deodorant stick for this reason. Baking soda is still included in this recipe because it is a great deodorizer and I really don’t want to smell! It has not been irritating to anyone in my family so far. Lastly, I used candelilla wax. This wax has a higher melting point than beeswax, but it is not a super hard wax. It has a very smooth and shiny consistency and works very well in this homemade deodorant stick. This is optional, but I used a blend of essential oils to add a subtle fresh aroma to this DIY deodorant. Cedarwood, marjoram, and bergamot essential oils give this deodorant a bright, refreshing smell. You can certainly choose to omit these if you are sensitive to essential oils or if you would prefer not to have them in a product you use daily. This recipe is extremely economical! You can add more or less wax for a firmer or softer consistency, but this recipe is what I have found to work best for us. We haven’t noticed any oil stains on our clothing and find that anything on clothes washes out easily. Combine jojoba oil, arrowroot powder, and baking soda in a small bowl. Stir well until fully combined and no lumps remain. Place a glass measuring cup in a pot of boiling water (or use a double boiler). Add candelilla wax to the measuring cup and melt. Once melted, pour in the jojoba oil, baking soda, and arrowroot powder. When all is liquid once again, add in shea butter and stir until just melted. Take off the heat and allow to cool slightly. Add in essential oils and stir well. Let cool until slightly thick, but still pourable. Pour into deodorant tubes and allow to cool completely before adding caps. Store in a cool, dry place until ready to use. Have you experimented with making your own homemade deodorant stick? If so, how has it worked for you? How to Make a Natural Homemade Deodorant Stick was written by Katie Vance. A homemade dog shampoo bar perfect for your dog(s). Because their skin and hair pH is more acidic than ours, they need a special recipe; this natural recipe delivers on all counts and is simple enough to make at home. Although it’s still winter, the temperatures in my area went into the 60s today. Being the cautious sort, I left my plants alone (sigh) and took my dog Sadie for a ride. Five minutes into the ride in a warm car convinced me that she needed a bath! Homemade dog shampoo bars are a lot like face & body bars, but your dog’s skin and hair pH is a bit more acidic than ours so a few changes are necessary. And adding some extra moisturizing ingredients and suds never hurts. This recipe is for a Shampoo Bar that is made using the cold process method. The basic recipe is the same as the others I have written about in the past, but you will have two sets of ingredients. Mix the lye into the distilled water and set aside. Blend all of your oils together, and heat slightly if the temperature of the mixture is under 100°F. Add the lye to the oils, stirring constantly. After 5 minutes of stirring, you can use a stick blender to mix thoroughly. When the mixture is thick and looks like vanilla pudding (this is called “trace”), add the next set of ingredients. Blend these ingredients in well and pour mixture into molds. After 24 hours, take out of the molds and cure 3-4 weeks. Rinse animal until thoroughly wet. Lather the soap into the hair and let sit for 5-10 minutes…if you can! Rinse well. Repeat if the pet is really dirty. When the weather is good, I use a kiddie swimming pool and keep the hose nearby. My dog loves cold water, but if you want it warm, you can hook the hose up to a faucet (in the laundry room or a kitchen sink) and run it out a window. The castor oil in this recipe creates more lather in the final product than you would normally get from just the base oils. It’s important to add the castor oil at trace because you don’t want this oil used up by the lye, you want it as an additional ingredient. The lemon juice or vinegar brings the pH of the soap down from around 9 to about 8. Seven is considered neutral. Your soap will not actually be neutral, but it will be closer than leaving it alone. Allowing it to cure for 6 weeks or more will also help create a milder bar. The essential oils listed are used as a bug deterrent. They will not only repel fleas but also ticks and mosquitoes. Since essential oils will evaporate after a while, I also make a spray with the same oils. Add 10 drops of each of the oils to a spray bottle with warm water and a tablespoon of alcohol. Shake each time you use it to disperse the oils. Spray around the ears and top of the head, avoiding the eyes. I don’t usually spray the back since the hair is thicker there. You can also make this homemade dog shampoo into a liquid. After the soap bars are cured, grate the soap with a box grater, use the large grate. Place a handful of the soap shavings in a quart jar and fill with warm water. Let sit overnight or for a few days. The soap shavings will soften up and eventually liquefy. When all are dissolved, gently shake the jar and then leave it to set up for a week or so. This will let any large pieces to settle to the bottom. Carefully pour the liquid into a bottle (recycled dish soap bottles with the spout tops work great!) and use this to shampoo your pet. I keep a jar liquefying all the time so I don’t have to wait for it when I need it. It will keep under the sink for a few weeks until needed. You can also use additional essential oils in the liquid shampoo. Use 5 drops of each and shake gently. Have you ever made homemade dog shampoo bars for your dog or liquid shampoo? Tell us about it! A Homemade and Natural Dog Shampoo Bar Recipe was written by Debra Maslowski. A homemade dry shampoo recipe that’s simple, inexpensive, all-natural, and wonderfully effective! What else could you ask for in a homemade beauty product?! How Often to Wash Hair? There was a time in my life when I was one of those people who washed my hair every single day. I took a shower every morning, dried my hair, and straightened it with a flat iron. I did that all through high school and college, even though it took me at least half an hour each day. Looking back, I can’t believe how much of my life I’ve spent drying my hair. After a few different hairstylists styled my hair and then said something like, “Wow, I hope you don’t wash this every day! That would take so much time!” it occurred to me that perhaps I really should start skipping a few showers. So I did. I started washing my hair every other day. It was a little oily at first, and sometimes it was really hard to make it through that second day without giving in and washing it. But I was determined to give it a good try at least, and within a few weeks my hair had adjusted to my new schedule and was hardly getting oily at all between showers. In fact, it went so well that I started fantasizing about going even longer without washing my hair. Could I wait three days? Four? A week? I had won back so much time in my life, and if anything, it made me detest styling my hair even more. Still, I was intrigued by the idea of dry shampoo, and it occurred to me that I could probably make some form of it on my own. Thus began my quest to develop a natural homemade dry shampoo! There are many different substances that you can use as the base of homemade dry shampoo. Ground-up oatmeal, arrowroot powder, and a variety of other fine, absorptive powders can be used. I like organic cornstarch because it’s easy to find and it’s something that I always have around the house anyway. Combine all ingredients well and store your all-natural, homemade dry shampoo in the container of your choice. Some good options are a mason jar with holes poked in the lid (the method I used), a large, un-used salt shaker, or a recycled parmesan cheese container. Apply dry shampoo at the roots of the hair. Use a brush or a comb and separate sections of your hair, shaking the powder onto your scalp. Massage it into the surrounding hair and let it sit for approximately two minutes–just enough time to absorb all that oil! When you’re finished brush the dry shampoo through your hair until it is no longer visible. I was eventually able to cut my styling time down to nearly nothing, by the way. It mostly involved giving up on straight hair forever and embracing my natural curls, but I have to say that dry shampoo helps too. It hasn’t replaced my regular hair-washing routine, but it does help me get an extra day or two when I need it. For something that’s simple and inexpensive to make, all-natural homemade dry shampoo is very effective! Don’t Want to Make Your Own? Love the idea of natural, nourishing shampoo, but don’t want to make your own? DIY Natural is happy to announce we finally found a line of natural hair products we can stand behind! Check it out here. Made with only pure, nourishing ingredients, your hair and scalp will be transformed by these. A Simple Natural Effective Homemade Dry Shampoo was written by Emry Trantham. I learned how to make eyeshadow because big name brands are so unnatural, and the natural brands were too expensive. This DIY eyeshadow turned out amazing! There is nothing more fun than making your own makeup. Experimenting with colors, ingredients, and styles is a great way to develop your own custom makeup. I have been wanting to learn how to make eyeshadow for some time now. Between the cost savings and the ability to customize my palette it was a DIY no-brainer. However, I was a little nervous about how to make a DIY eyeshadow. Some of the ingredients were foreign to me and I also needed to make sure all the ingredients I used would be safe near my eyes. I wear both glasses and contacts, so I was especially concerned about how those ingredients would wear. Note: here’s a bonus recipe on how to make eyeliner. A cosmetic brand that I love released a clay-based matte eyeshadow palette that I absolutely adore, but I don’t really want to spend $40 on eyeshadow at the moment. Instead of buying that palette, I decided to get a sampler of Brazilian clay from this company. It came with 0.2 ounces of five shades of Brazilian clay (natural, purple, yellow, pink, and dark red). That was just enough variation and substance to experiment with how to make eyeshadow, plus $7 was a great deal! Brazilian clay is great for DIY eyeshadows because it is slightly oil absorbing (like most clays), but not overly drying. Brazilian clay is also a fine powder like kaolin clay, so it blends well with other eyeshadow additives. I also wanted to add a bit of sparkle to my DIY eyeshadow (but not a lot of shine). I chose a merlot sparkle mica that was eye and lip safe. Not all natural micas are safe for eye and lip cosmetic formulation, so take care to find out if yours is before using it on your face! If you want more variety, you can choose many different types of micas. From deep red to purple to green and blue, there are so many gorgeous micas. When learning how to make eyeshadow, it is important to have a binder. This helps all the ingredients blend and stay together. It also helps your eyeshadow colors go farther. Since I have lots of arrowroot powder on hand, I decided to use this. Other binders include titanium dioxide, zinc oxide, and magnesium stearate. Some of those add extra sheen to eyeshadows. I’m not a huge fan of loose eyeshadows because I am afraid loose flecks of powder will irritate my eyes. That is why I chose to make a pressed eyeshadow palette. This also required the addition of oil which can greatly shorten the shelf life of your shadow. I chose to use red raspberry seed oil because of its stable nature and long shelf life. Red raspberry seed oil is also very light and has a nice subtle, fruity scent. Finally I needed an empty, sterile eyeshadow palette. I bought this one because it has a magnetic base with individual metal tins. It was easy to sterilize the metal tins with 91% alcohol before filling them with my DIY eyeshadow. These instructions for how to make eyeshadow are a little more involved than most of my recipes, but definitely worth it! I encourage you to experiment with colors to find your own perfect palette! Since the instructions are a little complicated for this DIY I will give them in two parts. 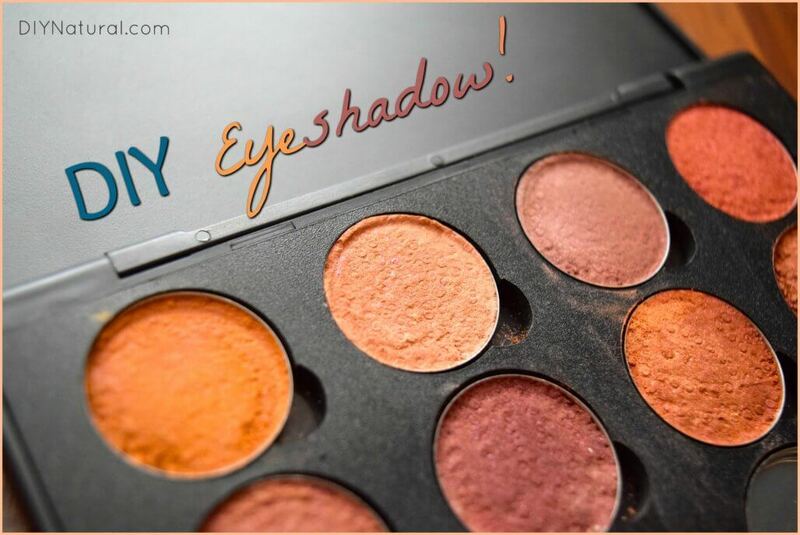 First I will tell you the general method to making clay DIY eyeshadows. Next I will give you individual recipes for the colors I made. Set ingredients on a clean work space. You will want to have plenty of room. Sterilize mixing bowl and eye shadow tins by spraying them with alcohol. Measure arrowroot powder, clay, and mica into small mixing bowl. Stir together with toothpick to blend. Add in several drops of red raspberry seed oil and alcohol. Stir well, breaking up any clumps with a toothpick. Continue stirring until all the oil and alcohol is incorporated. If needed, add additional drops of oil or alcohol until the mixture resembles tiny crumbs. Place half of the mixture in an empty tin. Cover with a paper towel. Using a quarter, press down evenly on the paper towel directly over the eyeshadow tin. Remove paper towel and add in the rest of the loose eyeshadow. Cover with a paper towel once again. Allow the eyeshadow to dry, then place in magnetic palette. Repeat each of these steps to make the next color. Make sure to sterilize your mixing bowl and instruments after each use to prevent bacterial growth! 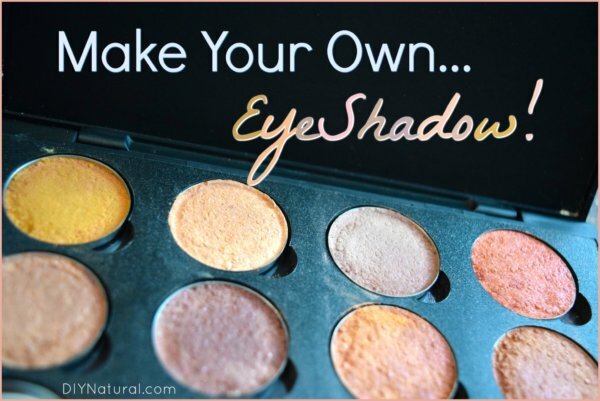 Now that you know how to make eyeshadow, go get the ingredients and get started! Be sure to share you experiences in the comments below. 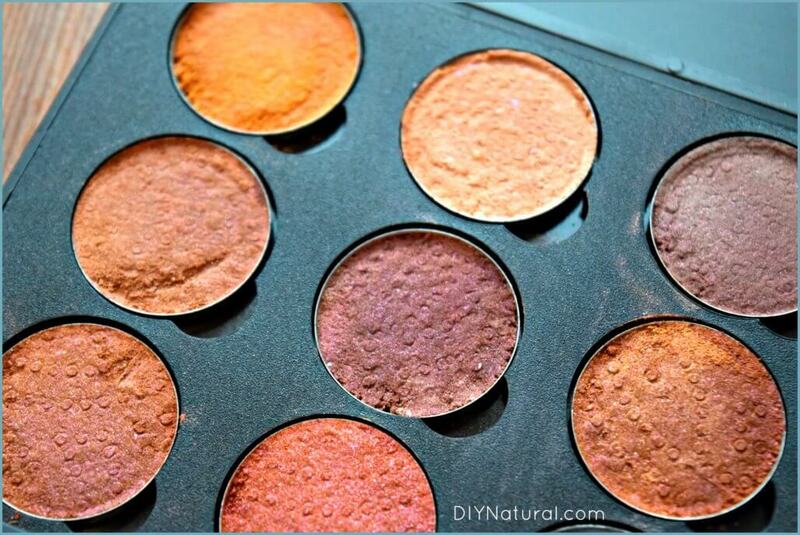 How to Make A Brazilian Clay Eyeshadow Palette was written by Katie Vance. Homemade shampoo can be made with just two natural ingredients, which you likely already have. It’s also cheaper than store bought and works just as well. Note: Complete with answers to frequently asked questions. Do shampoo manufacturers have your best interest at heart? Perhaps you believe they do, but since you’re here reading this article we’ll assume you’re at least becoming skeptical. It’s simple. No one cares more about your pocket book or your hair than you. That’s why you’re here. That’s why you want to make your own shampoo. And that’s why you want to make more of your own products. So do we! To make this shampoo, commonly referred to as “no-poo,” you will only need 2 ingredients. Never mistake simplicity for ineffectiveness. I double dog dare you to make, use, and compare this shampoo. After you’re convinced I want you to share the information with every one you know. We mix ours in double batches into a clean, repurposed shampoo bottle. Feel free to use whatever container you like, doubling up on ingredients until it’s full. Simply shake the bottle before each use and squirt directly onto scalp and hair. Gently massage into the scalp hair for a minute or two and rinse well. For best results, follow with homemade conditioning rinse. The homemade conditioning rinse is imperative for restoring the pH of your hair and smoothing the hair cuticle. It will also keep your hair from feeling greasy/sticky after using homemade shampoos. UPDATE: This shampoo is not intended for daily use, as the baking soda can potentially be drying to hair and scalp. We recommend using it as a clarifying shampoo. It’s perfect for those times when you got a little carried away with hair products and need to remove some buildup, or when you’re first switching over to homemade shampoos and need to remove some of the buildup commercial shampoos can leave behind. This homemade shampoo will give best results when used with soft water. I’m glad you asked… it’s one of my favorite parts. Cost = approximately $0.06/ounce depending on how much you pay for your baking soda. If an average bottle of shampoo is a 16 ounce bottle this shampoo will cost you less than a dollar. Not too shabby. This shampoo is completely safe for all hair types and will not strip your hair of its natural oils, unlike most commercial shampoo. If you have questions read the comments below or ask anew… and share this recipe with everyone you know! Be sure you’re trimming your ends every 6-8 weeks, less split ends = less static. Try shampooing less often (every other day or 3x/week). Use less heating elements (blow dryers, flat/curling irons, etc.). Try massaging in a Tbsp of olive oil once/week then rinsing. Melt a small amount of coconut oil in your hands and rub through the ends of your hair, avoiding your scalp. Another treatment to try is avocado w/lemon juice – mix, smash into hair, let sit 30 mins and rinse. Do occasionally – mix 2 egg yolks with 2 tsp lemon juice or vinegar. Work it into hair and let set a few minutes while showering. The egg binds with oils in the hair. Rinse with lukewarm water. Be sure to shake your homemade shampoo vigorously to ensure the baking soda is completely dissolved into the water. Massage baking soda shampoo into your scalp for at least 2 minutes. Give your hair a few weeks to adjust to the change (could take 2-3 weeks or more). Blend up some whole oats in a good blender (like a Vitamix) then mix with baking soda and water. Different people prefer different consistencies so add oat flour slowly until desired thickness is reached. Mix cornstarch or arrowroot powder with the baking soda and water (add enough for desired thickness). Use both oats and cornstarch. Try this mixture: 1 cup warm water, 1 tablespoon baking soda, and equal parts cornstarch and oatmeal flour to thicken (approx. ¾ tablespoon of each). How To Make Homemade Natural Shampoo was written by Matt Jabs. Exfoliate and moisturize with this amazing homemade body scrub. Use this simple recipe in your home and make them to give away as gifts for all occasions. I promised an article about a non-edible way to use your pumpkin pie spice so here it is, homemade body scrub! The DIY monster in me came alive again last week when I found a site featuring an article on making your own pumpkin spice sugar scrub. I remembered purchasing a similar body scrub for my sister a few years ago from Bath & Body Works that was priced between $15-$20! Knowing how much money I was about to save, I very quickly whipped up a batch, transferred it to a repurposed container, and labeled it with a cute tag (downloadable from the link above). Add Epsom salts or sugar to a bowl and slowly begin stirring in the oil until mixture is smooth, but not goopy. (You may not need the full cup of oil.) Add essential oil and any other fun additions and mix well. Spoon into a decorative container or glass jar with a tight-fitting lid. I used this recipe to make a Warm Vanilla Sugar Scrub (use vanilla essential oil or 2 Tbsp. vanilla extract), Lemon Salt Scrub, and a Grapefruit Mint Salt Scrub. I can’t wait to make several more batches and experiment with some more scents including peppermint, lemon-eucalyptus, and sweet orange-lavender. The yummy concoctions you can create are limitless. Note: Olive oil is not the best carrier oil for some homemade body scrub formulas because it has a strong fragrance. If you think olive oil will be overpowering in a delicately scented body scrub, choose one of the other carrier oils. I also love being able to use different sugars or Epsom salts – mainly because I had a huge bag of Epsom salts under the bathroom sink that was not getting used. (My organic cane sugar is not cheap!) Choose sugar for a fine grain, and Epsom salts for a larger grain homemade body scrub. The oil will separate in some of these scrubs, so it’s a good idea to attach a small spoon if giving away as a gift. In addition to my mom receiving one of these as a “just because” gift, I was able to give two body scrubs as birthday gifts this week, and another as a housewarming gift! I think these luxurious body scrubs will make the PERFECT holiday gift for friends and family. They are so simple to throw together, make a beautiful addition to a gift basket, and are great as a stand-alone gift. Give hand scrubs to a hard working friend to keep by the kitchen sink or a pampering homemade body scrub to use in the bathtub. Mix up a few of these this holiday season to give away as last minute I-didn’t-know-you-were-getting-me-something gifts. You will look ultra-prepared, crafty, AND thoughtful! 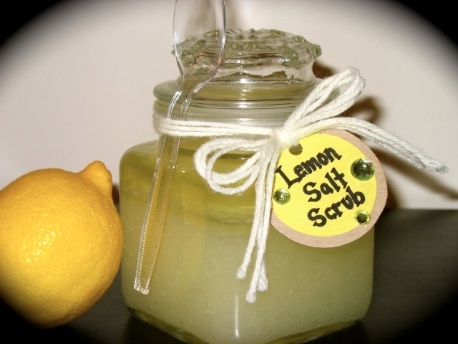 Homemade Body Scrub to Moisturize and Exfoliate was written by Betsy Jabs. How To Make A Naturally Tinted Lip Balm You’re Going To Love! © 2018 Skin Care Tips Guide. All Rights Reserved.